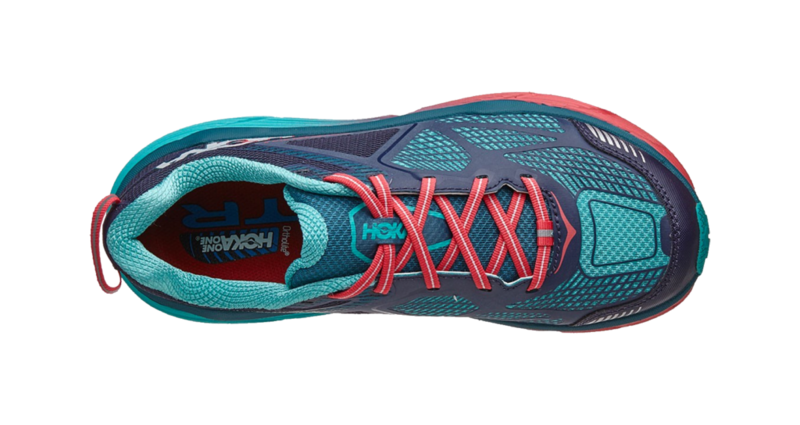 HOKA is a brand that I’ve always been curious about, though not interested enough, I guess, to buy a pair. WELL. No point in burying the lede here: consider me a convert. The Challenger ATR 3 is my first pair of HOKAs, but it will not be my last. I LOVE THIS SHOE. How does Hoka do it?! 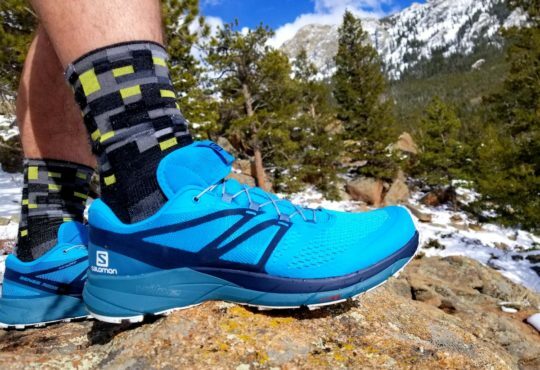 The Hoka Challenger ATR 3 is super cushioned. Like, really cushioned. But it weighs less than 8 ounces (7.9 for a women’s size 7)! It’s also responsive, and guys, this is just a fast shoe. I feel like it can do anything. One of my first runs in it was a nighttime trail race, and I was delighted with it; it felt stable and quick. The cushioning would also, I imagine, make this an excellent choice for a 50 or 100 miler. Have you ever run an ultra that had a road section long enough to be annoying because you had to run it wearing your trail shoes? I’ve done several road runs in the ATR, and they transition well from trail to road. 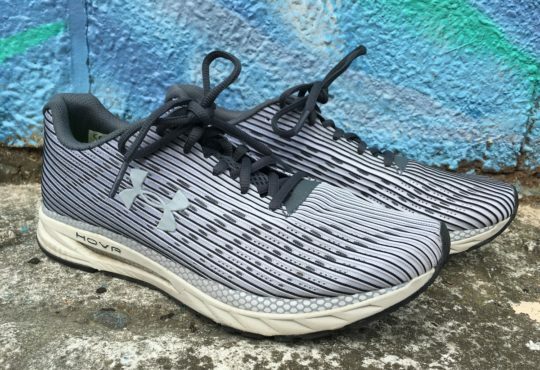 I should probably just go ahead and get a pair of Clifton, but in the meantime, I’ll continue doing 10 or so road miles in this shoe per week. In light of this, you may wonder how the ATR fares on technical terrain. I haven’t worn it on anything rocky, but I have done some moderately technical trails in it and was very happy with the performance. 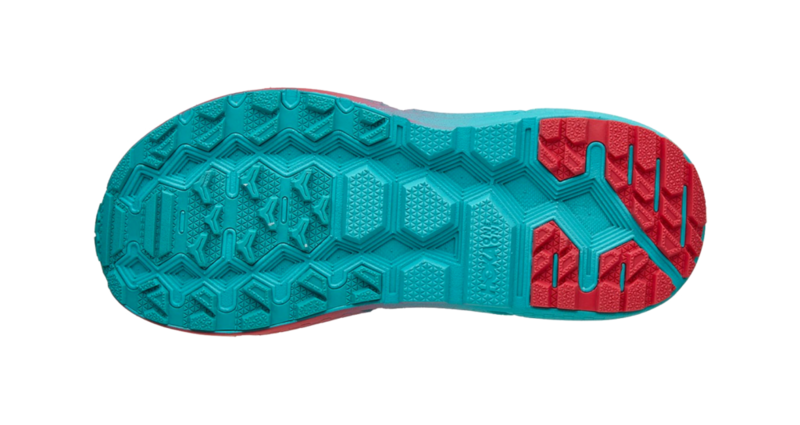 The 4 mm carbon lugs on the outsole work great but aren’t noticeable on smoother surfaces or asphalt. 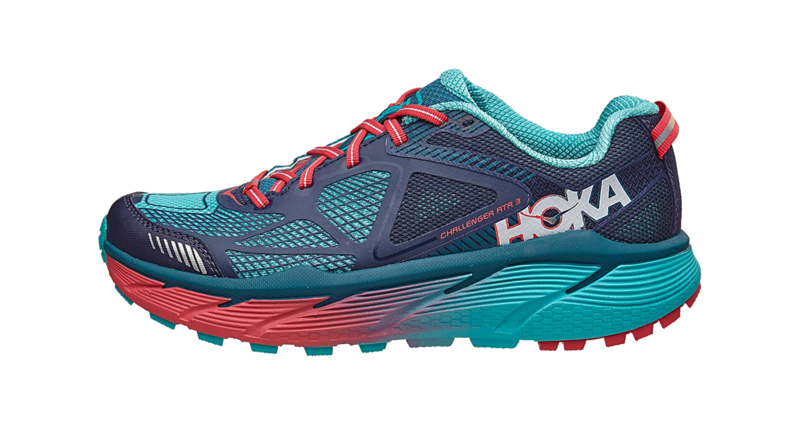 The Hoka Challenger ATR 3 is also a great-looking shoe. The upper has 3D puff print overlays as well as a bit of micro webbing, which seems to help with stability. 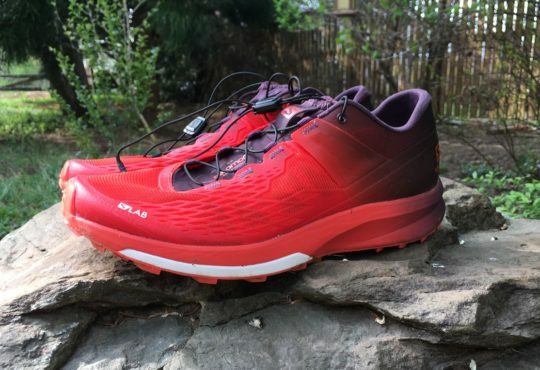 I haven’t gotten them too wet, but haven’t had any issues with them holding their shape (unlike the Altra Timp, which stretches out considerably). The laces are flat and a little stretchy, which I like. 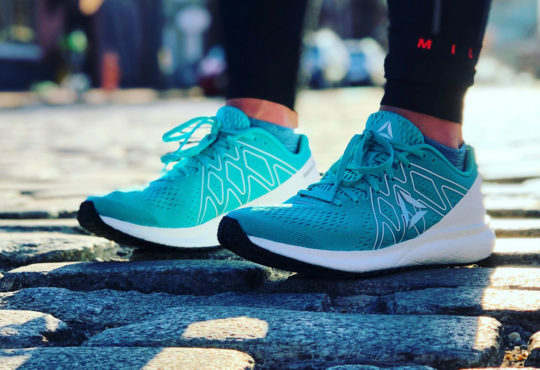 The only issues I have with this shoe are fit-related. 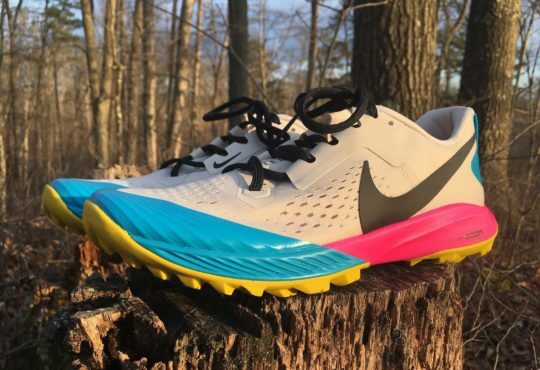 I’ve heard that the prior two versions of this shoe were narrow and that HOKA responded by widening the toe box in the ATR 3. I can’t imagine what the 1 and 2 felt like, because the 3 still seems narrow to me, and I don’t have unusually wide feet. The taper of the toe box is most apparent on the outside; I lose a little feeling in my pinky toes while running in these. Maybe ordering a half size up would help; I found these run a little short. The other fit problem I had was with the heel slipping a bit. I tried the heel lock lacing method, but that irritated the top of my foot; it would probably work just fine if there were a little more volume in the shoe. I decided I could live with the heel slipping and now I don’t even notice it. While I do wish the Challenger ATR 3 was a little roomier, primarily through the toe box, I love the shoe so much that I’m willing to overlook this. Seriously. 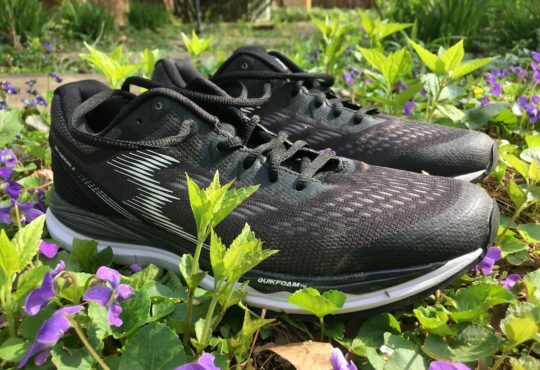 The Hoka Challenger ATR 3 may be one of those trainers I buy six pairs of at once in case they decide to ruin it with the Hoka One One Challenger ATR 4. Get your own pair.